We are excited to share with you plans for our upcoming Chessed trip for the Sophomore class. Our Rabbis teach us that the Torah stands on three legs: Torah, Avodah (prayer) and Gemilut Chassadim (Chessed and kindness). At YULA Girls Chessed/community service is an important part of our mission and central to everything we do. 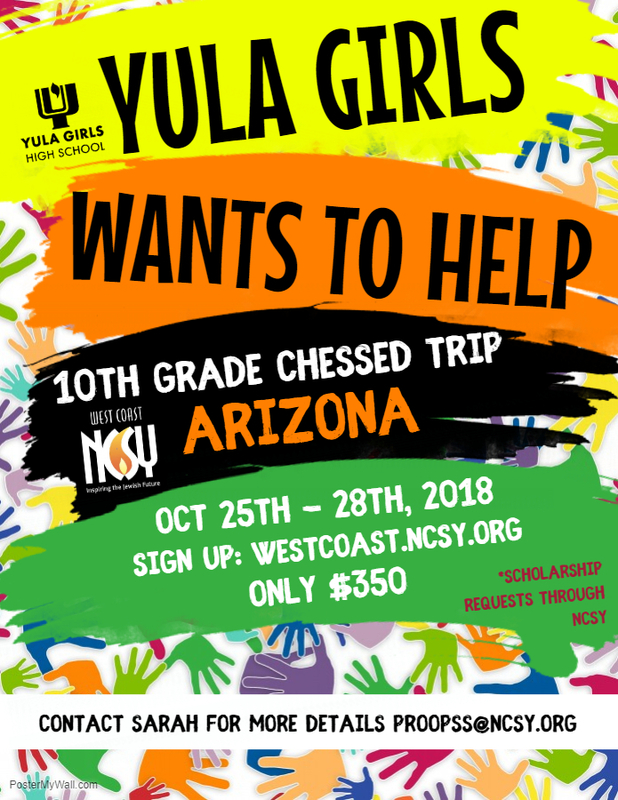 To that end, YULA Girls has partnered with NCSY to bring an engaging Chessed trip to our girls. The trip will take us to the Jewish communities of Arizona, in both Scottsdale and Phoenix on October 25th-28th, 2018. Our goal is to facilitate experiential education and to work with local shuls and community organizers in soup kitchens, day schools, and people with special needs. Although this will certainly help others, we have found that "giving" is the most direct route to receiving meaning and depth in one's own life. In addition to traditional community service opportunities, we will be formally infusing a local shul with our YULA Girls Ruach throughout our Shabbat together. The cost for this unforgettable experience is $350 per student and scholarships are available through NCSY. The deadline to register for the trip and scholarship is October 12th. If you have any questions, please contact our Chessed Coordinator, Sarah Proops at proopss@ncsy.org.